Samsung Galaxy S10 Plus revealed the appearance of Onleaks renders . This is a smartphone that we already know quite a lot, because it was also noticed in the AnTuTu benchmark database . 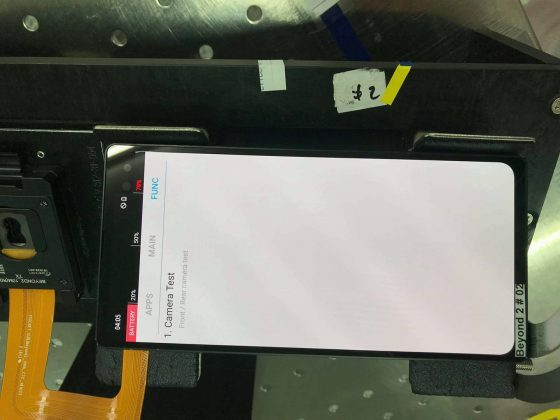 Now we have a photo of the smartphone prototype. The picture has been published on Facebook and you can see it below. What can be seen on it? Galaxy S10 Plus is created under the code name Beyond 2. The name can be seen on the photo of the prototype. We see that Samsung is running some camera tests here. You can also see two lenses from a selfie camera. The whole was placed in a special housing. You can not see more details in this picture. Samsung Galaxy S10 Plus will be presented at the end of February. During the MWC 2019 exhibition in Barcelona. In addition to the standard version of the phone, there will also be a cheaper variant, which is called Lite. Lately, it could be seen on renderings of the outer casing . Known technical data Galaxy S10 Plus can be found below.